Cryptocurrency-backed loan platform Nexo has announced the addition of Litecoin as the latest collateral option for its instant credit lines, according to an email that the company sent to its users on Friday. The announcement was made public with a Medium post made on Saturday, March 29th. Litecoin is joining a number of other major cryptocurrencies that Nexo accepts as collateral, including Bitcoin (BTC), Ethereum (ETH), Binance’s native token (BNB), Ripple (XRP), and NEXO. The current APR for crypto-backed loans on Nexo is 16 percent–just 8 percent for users who use NEXO tokens as collateral. At the time of writing, the price of Litecoin was up by roughly 0.70 percent. 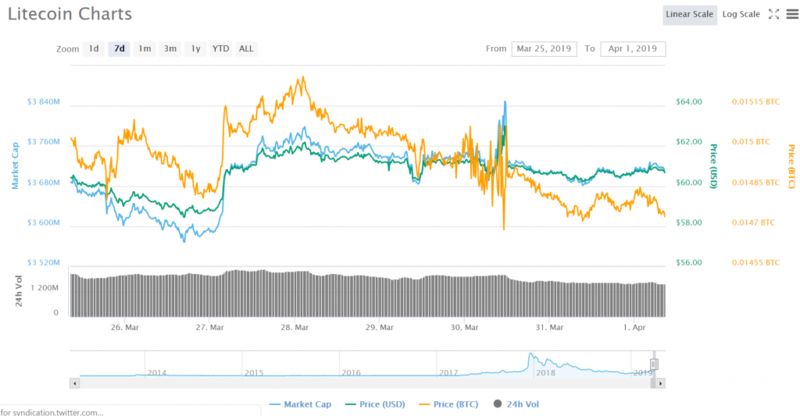 However, it’s unclear how much of this price increase is due to Nexo’s announcement–other major cryptocurrencies have also had marginal price increases over the last several hours. On the other side of Nexo’s crypto-based lines of credit are opportunities for crypto users to loan out their coins in exchange for lending them through the system. In exchange for lending coins through ‘interest bearing crypto acounts’, the company is offering up to a 6.5 percent annual return on stablecoins, including Tether (USDT), TrueUSD (TUSD), Circle’s stablecoin (CUSD), Maker’s Dai (DAI), and Paxos Standard Token (PAX). Interest on each of the coins kept in Nexo accounts will be compounded each day; users’ funds will be protected by custodial insurance. Nexo is somewhat unique in that it allows its users to withdraw their funds at any time, rather than forcing funds to be locked inside of a system for a fixed period. Opportunities to earn passive income through interest-paying cryptocurrency accounts are on the rise, according to a new report from Bitcoin.com. These interest-paying accounts encourage crypto users to ‘hodl’ onto their coins for long periods of time. Nexo isn’t the only company to have offered opportunities to make money off of hodling. Coinbase Custody offers SaaS (staking as a service), which requires hodlers to lock up Proof of Stake (PoS) tokens for an extended period of time. This results in annual gain, but Coinbase takes its own cut. Crypto analyst Zane Pocock said in a Medium post on March 29th that programs such as these that offer the opportunity to “financialize” bitcoin and other cryptocurrencies are important for the future of the crypto ecosystem. “Financialized structures allow for much better liquidity, debt structures, and other benefits that mean institutional custody and lending can be good for Bitcoin,” he explained.